iPhone App Saves Life, Literally! We have all seen how companies try to hype up their device to sell more units. Apple is no different. One can market iPhone as a device that saves time, makes people productive, and does all kinds of things on the go. You can now add saving life to the list of things an iPhone is capable of. The earthquake in Haiti has devastated that region, and many have not been lucky enough to survive this disaster. But one lucky individual was able to survive the disaster by taking advantage of a CPR app and timer on iPhone. This is truly an incredible story. Dan Woolley may have not expected such an earthquake when he went to Haiti, but he ended up under the rubble anyway. By taking advantage of his iPhone and Pocket CPR app by American Heart Association, he managed to find a way to stop bleeding and survive the ordeal. The circumstances are very extreme, and there is an element of luck involved here. At the same time, it just goes on to show how far Apple has come with iPhone and its apps. iPhone has become more than just a phone. It has become a tool that lets people get more done on the go, including saving lives. You can expect more people to get inspired by this story and install apps that can help them stay safe on the go. 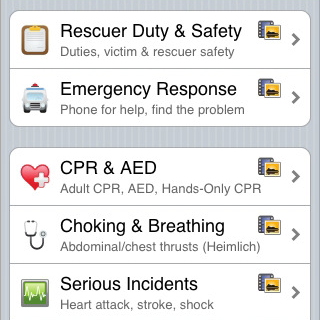 Pocket CPR is only an example of apps that can be life savers. But it can be looked at as a blueprint for people who are into making handy apps. Pocket CPR comes with tips, illustrations, and videos one would need to perform life saving procedures on the go. That’s probably what saved Dan’s life. Emergency apps are always going to be in demand, and this new story is only going to make them more popular. In the past, people used to not get on the road without the right tools. Now they’d probably want to make sure they have the right apps on their iPhone before hitting the road. A clear demonstration of why Apple’s app strategy was and continues to be genius.